The desert willow (Chilopsis linearis) and the weeping willow (Salix babylonica) are two tree species commonly used in landscaping for their graceful, sweeping habit. Though the desert willow is a member of the Bignonia family, not the willow family, the tree superficially resembles a willow thanks to its long, slender leaves. Both trees can be cultivated as ornamental trees in various regions throughout the United States. The desert willow is a small tree that reaches an average height of about 25 feet. The tree is notable for its long, pale green leaves and showy, orchid-like flowers, which appear in late spring and may last until the end of summer. The weeping willow is a distinctive tree that may grow to be 50 feet high, with a similar spread. The tree has a rounded crown with hanging branches and long, lean leaves. A native of the American Southwest, the desert willow can be found growing along desert washes and creeks in the Mojave, Sonoran and Chihuahuan deserts, from California all the way to Northern Mexico and Southwest Texas. 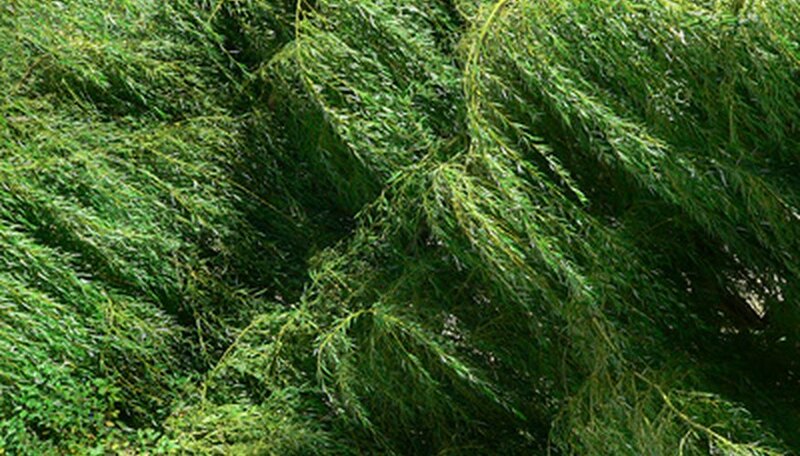 The origin of the weeping willow is unknown, but the tree is thought to have originated in Central Asia. The tree thrives in wet conditions in temperate zones, and is a popular landscaping tree throughout the United States in USDA zones 4 to 9. Desert willow is a hardy, small tree that may be grown in hot climates for its stunning flowers. The tree may also be pruned into a more manageable shrub in a desert garden. Weeping willows are romantic ornamental trees that can provide an accent of color by a river, pond or stream. The weeping willow can also be used as a specimen tree on a large, well-irrigated lawn. As a desert native, the desert willow must be grown in full sunlight to thrive. The tree requires a well-draining, rocky or sandy soil. Desert willow is highly drought-tolerant and requires little supplemental water. The weeping willow is a water hog that must have access to moisture. The tree does best next to a body or water, or with regular and generous irrigation. The weeping willow isn't picky about soil types, though it should be grown in full sunlight to look its best. The desert willow is remarkably pest free, but may suffer from aphid attacks and verticillium wilt, a fungal disease that causes premature leaf wilting and discoloration. Weeping willows are host to a range of problems, and are susceptible to insect infestations. Both trees are short-lived, and the weeping willow is particularly messy, dropping an abundance of leaves and twigs beneath it. The deep roots of the weeping willow may inadvertently clog or disrupt pipes beneath or near the tree.